Hygienically clean electromagnetic liquid flow velocity meters for food, drink and pharmaceutical processes. Magnetic flow meters are used to measure the flow velocity of conductive fluids in a pipe. There are no moving parts in contact with the fluid making it possible to measure fluids which contain solids. The internal surface of a magflow meter exposed to the fluid flow, which is called a liner, can be made from different materials. This makes it possible to use a magnetic flowmeter to measure corrosive chemicals by selecting a compatible liner material. In a similar way to an electromagnetic generator, the magnetic flow meter works by the same operating principle. The conductive fluid passing through the flowmeter is analogous to the copper wire. The magnets and electrodes are fitted behind the liner, and the resulting voltage generated provides the sensor signal instead of being used to provide electrical power. 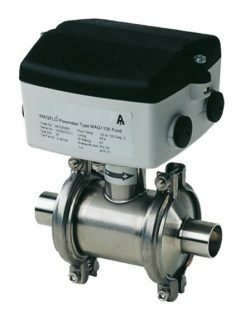 Since Magnetic flow meters have a smooth crevice free surface and no moving parts exposed to the process fluid, they are often used in food processing plants, breweries, wastewater treatment works, chemical process plants, water treatment works, pulp & paper mills and pharmaceutical plants. Send us your enquiry for Hygienic Magnetic Flow Meters to get assistance with this product type.